Composite materials (also referred to as composition materials, or simply composites) are materials formed by combining two or more materials with different properties to produce an end material with unique characteristics. These materials do not blend or dissolve together but remain distinct within the final composite structure. Composite materials can be made to be stronger, lighter or more durable than traditional materials due to properties they gain from combining their different components. Most composites are made up of two materials - the matrix (or binder) surrounds a cluster of fibers or fragments of a stronger material (reinforcement). A common example of this structure is fiberglass, which was developed in the 1940’s to be the first modern composite and is still in widespread use. In fiberglass, fine fibers of glass, which are woven into a cloth of sorts, act as the reinforcement in a plastic or resin matrix. While composite materials are not a new concept (for example, mud bricks, made from dried mud embedded with straw pieces, have been around for thousands of years), recent technologies have brought many new and exciting composites to existence. By careful selection of matrix and reinforcement (as well as the best manufacturing process to bring them together) it is possible to create significantly superior materials, with tailored properties for specific needs. Typical composite materials include composite building materials like cement and concrete, different metal composites, plastic composites and ceramic composites. 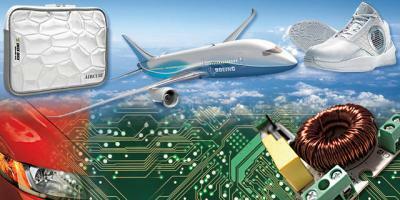 How are composite materials made? The three main factors that help mold the end composite material are the matrix, reinforcement and manufacturing process. 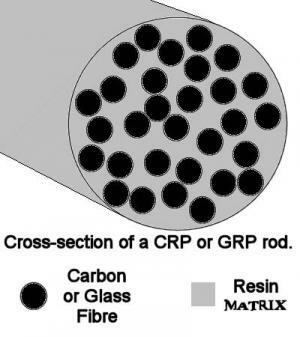 As matrix, many composites use resins, which are thermosetting or thermosoftening plastics (hence the name ‘reinforced plastics’ often given to them). These are polymers that hold the reinforcement together and help determine the physical properties of the end composite. Thermosetting plastics begin as liquid but then harden with heat. They do not return to liquid state and so they are durable, even in extreme exposure to chemicals and wear. Thermosoftening plastics are hard at low temperatures and but soften with heat. They are less commonly used but possess interesting advantages like long shelf life of raw material and capacity for recycling. There are other matrix materials such as ceramics, carbon and metals that are used for specific purposes. Reinforcement materials grow more varied with time and technology, but the most commonly used ones are still glass fibers. Advanced composites tend to favor carbon fibers as reinforcement, which are much stronger than glass fibers, but are also more expensive. Carbon fiber composites are strong and light, and are used in aircraft structures and sports gear (golf clubs and various rackets). 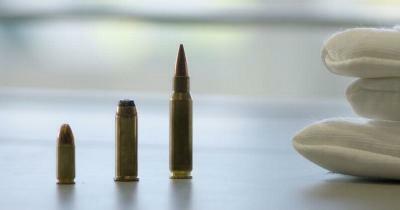 They are also increasingly used to replace metals that replace human bones. Some polymers make good reinforcement materials, and help make composites that are strong and light. The manufacturing process usually involves a mould, in which the reinforcement is first placed and then the semi-liquid matrix is sprayed or poured in to form the object. Moulding processes are traditionally done by hand, though machine processing is becoming more common. One of the new methods is called ‘pultrusion’ and is ideal for making products that are straight and have a constant cross section, like different kinds of beams. Products that of thin or complex shape (like curved panels) are built up by applying sheets of woven fiber reinforcement, saturated with matrix material, over a mould. Advanced composites (like those which are used in aircraft) are usually made from a honeycomb of plastic held between two sheets of carbon-fiber reinforced composite material, which results in high strength, low weight and bending stiffness. Where can composites be found? Composite materials have many obvious advantages, as they can be made to be lightweight, strong, corrosion and heat resistant, flexible, transparent and more according to specific needs. Composites are already used in many industries, like boats, aerospace, sports equipment (golf shafts, tennis rackets, surfboards, hockey sticks and more), Automotive components, wind turbine blades, body armour, building materials, bridges, medical utilities and others. Composite materials’ merits and potential assures ample research in the field which is hoped to bring future developments and implementations in additional markets. Modern aviation is a specific example of an industry with complex needs and requirements, which benefits greatly from composite materials’ advantages. This industry raises demands of light and strong materials, that are also durable to heat and corrosion. It is no surprise, then, that many aircraft have wing and tail sections, as well as propellers and rotor blades made of composites, along with much of the internal structure. Graphene is a two-dimensional matrix of carbon atoms, arranged in a honeycomb lattice. A single square-meter sheet of graphene would weigh just 0.0077 grams but could support up to four kilograms. That means it is thin and lightweight but also incredibly strong. It also has a large surface area, great heat and electricity conductivity and a variety of additional incredible traits. This is probably why scientists and researchers call it “a miracle material” and predict it will revolutionize just about every industry known to man. 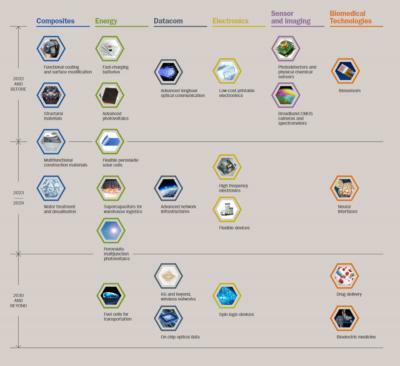 As was stated before, graphene has a myriad of unprecedented attributes, any number of which could potentially be used to make extraordinary composites. The presence of graphene can enhance the conductivity and strength of bulk materials and help create composites with superior qualities. Graphene can also be added to metals, polymers and ceramics to create composites that are conductive and resistant to heat and pressure. Graphene composites have many potential applications, with much research going on to create unique and innovative materials. The applications seem endless, as one graphene-polymer proves to be light, flexible and an excellent electrical conductor, while another dioxide-graphene composite was found to be of interesting photocatalytic efficiencies, with many other possible coupling of materials to someday make all kinds of composites. The potential of graphene composites includes medical implants, engineering materials for aerospace and renewables and much more. ECD Lacrosse, manufacturer of high quality lacrosse equipment, has teamed up with Global Graphene Group (G3) to develop ECD's Rebel +Graphene heads, which were released in a limited edition. The customized composite of G3’s graphene with ECD’s polymer reportedly benefits from graphene's properties, including its light weight and impact resistance. The resulting Rebel +Graphene lacrosse heads exhibit increased impact strength, increased stiffness, and no perceptible additional weight. Reports out of China state that Chinese authorities have audited and approved research by Linglong Tire into the "large-scare application" of graphene rubber composites in tires". The research was conducted jointly by Beijing Tiancheng Linglong Tire, a wholly-owned subsidiary of Linglong Tire, and Beijing University of Chemical Technology. An audit was conducted by Beijing Municipal Science & Technology Commission along with other Chinese technology institutes. The labs of Rice University chemist James Tour and Christopher Arnusch, a professor at Ben-Gurion University of the Negev in Israel, introduced a batch of graphene-enhanced composites that can be a step towards more robust packages. 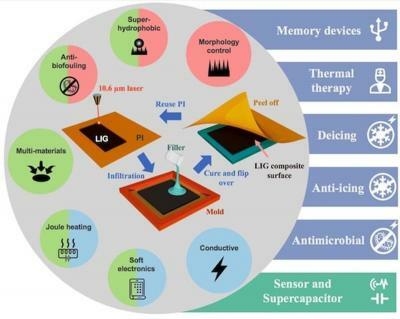 By infusing laser-induced graphene with plastic, rubber, cement, wax or other materials, the lab made composites with a wide range of possible applications. 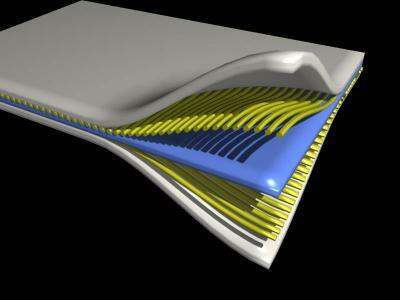 These new composites could be used in wearable electronics, in heat therapy, in water treatment, in anti-icing and deicing work, in creating antimicrobial surfaces and even in making resistive random-access memory devices.